James Hewitt has announced that he plans to sell love letters between himself and Diana for £10 million. More information here. However, ThroneOut can reveal exclusively Hewitt's new business venture that is set to earn him considerably more. He has partnered with a new age cult in order to product a 'Create your own Prince Harry Half-Brother' kit. ThroneOut obtained a beta version of the pack, the back of which claims to offer 'an authentic Hewitt impregnation experience'. No instructions were included but the kit contains a small sachet of white liquid, a small bottle of gin, a hairnet, two cigarettes and a small plastic syringe-like object similar in size and shape to 2" chipolata sausage. 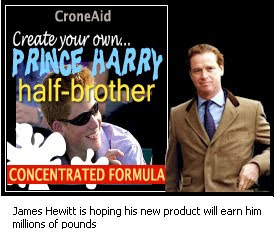 Hewitt was vague when questioned over how the product worked or how it was produced, leading some scientists to pour scorn on his claim to be able to produce Prince Harry half-brothers. Hewitt's integrity is bound to be criticized by many, with some considering the product very bad taste, although we found that mixing with blackcurrant did help somewhat. When asked if he was directly involved with the manufacturing he replied "of course", but admitted that the rate of production was unacceptably low due to the limited range of 'specialist' cable TV stations he could currently receive.